Creamer Media’s Real Economy Year Book has been divided into separate reports under the banner Real Economy Insight, and investigates key developments in the automotive, construction, electricity, road and rail, steel, water, materials handling and logistics, pumps, coal, gold, iron-ore and platinum sectors. 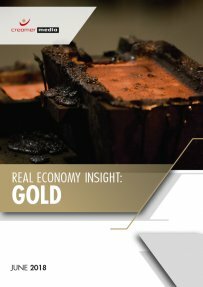 This five-page brief is a synopsis of key developments in the gold sector over the past 12 months. It provides an overview of the global and South African gold market, including labour challenges, the silicosis class action law suits South Africa’s gold producers are facing, illegal mining, the gold price and outlook for the sector. This brief has been compiled using information published in Engineering News and Mining Weekly, as well as information available in the public domain, and does not purport to provide analysis of market trends. Published on: 29 June 2018.